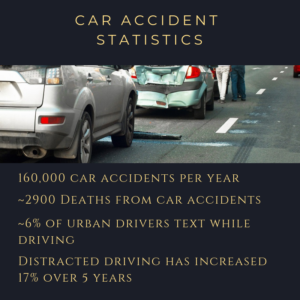 Auto accidents are still a leading cause of injury and death in Canada, and the incredible forces involved when your automobile collides with another increases the odds that you will suffer catastrophic injuries, often through no fault of your own. In the event of an accident, your insurance company is supposed to help, but you may find that they delay or withhold payments for services that are included in your coverage. If you have been in a motor vehicle accident, contact the auto accident lawyers at Findlay Personal Injury Lawyers today. We offer a free legal consultation, and can help you figure out the compensation you are entitled to, and what the best options are for securing it. Call 905-522-9799 to schedule your free consultation today. The circumstances of your auto accident can change a lot about the nature of your case. Some clients simply need help recovering accident benefits from their insurance company, while others want to pursue a lawsuit against the driver who was at fault. Questions of liability and damages change depending on the size of the vehicles, the circumstances of the crash, and the presence of any commercial vehicles. For more information on your accident, we recommend that you schedule an appointment with one of our auto accident attorneys. Car insurance in Ontario operates under a “no-fault” system. This means that your own insurance company pays for your lost wages, your medical costs and other out-of-pocket expenses, regardless of who is at fault. Laws like these are designed to ensure that your medical costs will be covered in an auto accident. However, they also create incentives for your insurance company to withhold extra benefits that may help you recover after a crash. It’s important to hire an auto accident attorney as soon as possible after a motor vehicle crash. The sooner you have an experienced and competent legal team on your side, the better your chances of building a solid case. Additionally, new laws governing auto accident compensation may affect your legal claim, and our lawyers can see to it that these laws are followed. Findlay Personal Injury Lawyers has been handling auto accident lawsuits in Ontario for the past 40 years, and in this time have developed a recognized expertise. We know about the importance of keeping you involved and informed as we move forward with your legal claim, and we will devote as much time and care to your case as necessary to secure a favorable outcome. To learn more about your options after an auto accident, contact Findlay Personal Injury Lawyers today by calling 905-522-9799. We serve clients throughout southern Ontario, including the nearby cities of Hamilton, Brantford, Burlington, Stoney Creek, and Niagara Falls.